What Is Geocaching? What's Inside a Geocache Box? What is Geocaching and How Is It Done? If you and your young adults need more activities to do when you spend time together, consider geocaching. A worldwide game that involves everything from clues to camping, geocaching is a great way to spend some time outside, using your tech skills and tools like GPS, Google search and more to find treasures hidden in the most unlikely places. 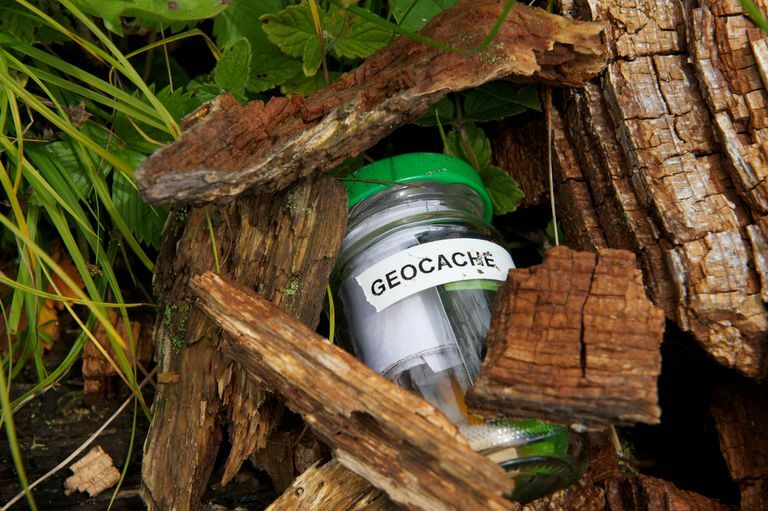 Geocaching is the world's largest treasure hunt. It's like a grown-up version of the beloved childhood pastime, except it's no joke. Geocaching is the real deal. The high-tech treasure hunt combines GPS tracking with outdoor adventure, and it's fun for all ages. There are more than 2 million geocaches are hidden all around the world in parks, trails and urban areas. In fact, there are probably some near you as you're reading this. But finding the GPS coordinates is only half the game. First, you have to find the box. What Is a Geocache Box? Geocache boxes come in all different shapes and sizes. It can be anything, but it's usually a small metal or plastic box that can withstand the elements. It might be camouflaged as an Altoids tin, a can of mixed nuts or an ammo box. What's inside the cache isn't the point. The point is everything else: the fun of the hunt, the thrill of discovery and the sheer delight of finding new places with good friends. That said, you'll still open the box with more than a little excitement, jot your name in the log, then take something and leave something. You'll want to come prepared with a pencil or pen, and a trinket or two to swap. A log. Finders log their name, the date and any comments in a small notebook or rolled up piece of paper that is often enclosed in a plastic bag for protection from moisture. A pencil. Many caches will include a pencil, but bring your own to jot down notes just in case. You can also use your phone for notes if that's easier—whatever makes the geocaching experience more fun and easier to do. Inexpensive treasures. You're probably not going to find any gold coins in a geocache. Instead, think McDonald's Happy Meal toys, plastic dinosaurs, arcade tokens and other cheap trinkets like Cracker Jack prizes or inexpensive birthday party favors. Found treasures. Some boxes contain treasures found near its location, like small shells, a rock, a feather or a pinecone. These are fun to have to remind you of your geocaching adventures and where they have taken you. Travel bug. Occasionally you might be lucky enough to find a Groundspeak Travel Bug or Geocoin. These extra special trinkets are logged and tracked online as they move from cache to cache in the real world. The Travel Bug looks like a metal tag and is typically attached to an item. Geocoins look like elaborate coins or medallions. Each contains a special tracking number that you can follow in real time. The joy of the discovering the box and the surprise of the trinkets inside of it are the bonus to a fun day spent hiking, biking, trekking and searching in unfamiliar places with lots to discover. Your young adults may not think it sounds fun at first, but once you get them started they'll enjoy geocaching. Could My Child Benefit From Play Therapy? What Happens at a Kindergarten Screening? What Is Non-Verbal Learning Disability? Will Your Child Get Anything Out of Kindermusik Classes? What Is Taught to Kids in Second Grade? What Does it Mean to Have a Learning Disability in Applied Math?